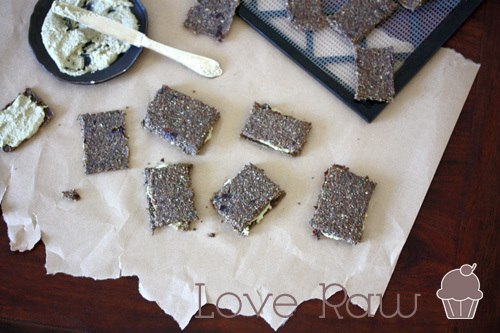 Love Raw: The recipe for Cracking up and Crackers. The recipe for Cracking up and Crackers. I've gone through some massive inner change the last couple of weeks, unraveling a great deal of old structures that has been in the way for me. I had reached a point where it needed to be removed, leaving me rather empty and confused to be honest. You know the feeling of having a fresh new start, but it doesn't quite feel as ~whoopi doo~ as it's "supposed to"? Without revealing too much of my voulnerable inner micro-super universe, I'm in the middle of some ruthless cutting of the cords that should be done a looong time a go. Being over empathic surely doesn't make it easier. But at the point where I was before I made the descition, I couldn't carry on compromising my Truth. Let go or die. So I let go, and here I am. A new born who has no clue how to do IT. Hehe, I need a foolproof crash course in how to go on after being purified of some "demons" without knowing my new self even a tiny bit. At the same time it's all I know, it's the very rhythm of my heart. But what r.e.a.l.l.y scares me, is what is coming as a result of doing this. Something inside that wants to brake loose and run wild, explode, fly free, drop the steering wheel with closed eyes in full trust. There's no room for compromising even a tiny bit. The presence of the Animal is everywhere in and around me. Animals don't compromise. If you know you have some really beautiful gifts up your sleeve, and know that they are not available for you until you do the great leap out in the unknown (without crutches), and for you to make the leap, you have to say good by to what ever holds you back. Every old, fear-based structure in relationships foremost, convictions, believes, behavior, habits, places... everything. Then you know what I'm going through. I've been here before. Trying, trying, but lacked in courage and faith. Now I've done the work, connected with key people with the knowledge and guidance to push me forth, I've grown thicker skin and made some heavy decisions. Passively waited for years to get access to these gifts I've always known that I had, not knowing how to unlock them. I still don't know the secret recipe to the success. Most of all, I know exactly what I don't want. Life taught me through extreme experiences of contrast, which will come in handy in the long run. I don't have a map, but my heart as a compass, God as my best friend, my truth as a land mark and my love Jakob by my side. As you know, every journey starts with one step, and the journey into the unknown is something we all have to face sooner or later, once or twice in our life. The birthing process is indeed painful, people fear change, fear their radiant inner light and have a hard time breaking old habits. But the only way out is through. Now I'm curious to know if you have been or find yourself in a situation like mine, what is your best remedy to make the journey smooth and joyous? Of course, a great journey does require some Lambas bread, in true elvish style, don't you think? 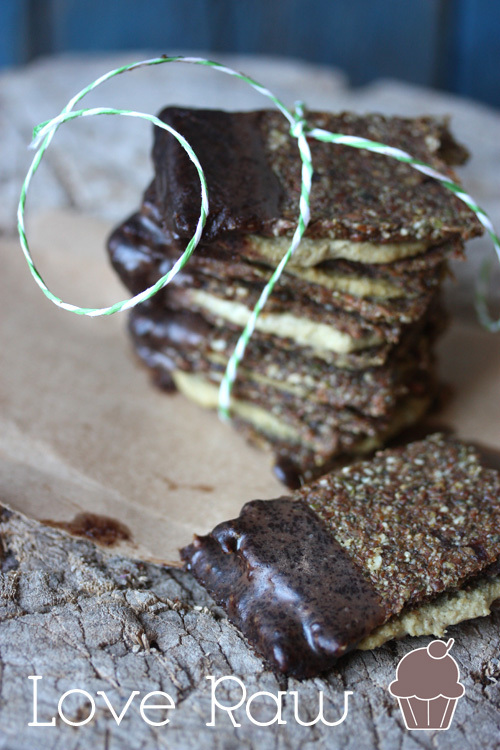 These crackers might not give you energy for 24 hours, but oh my lord are they delicious! 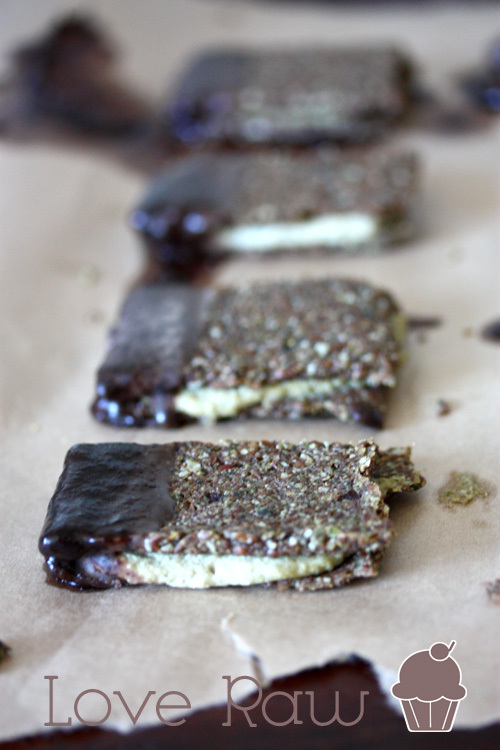 The mint flavored raw chocolate on top, a silky maca-cream between two cinnamon flavored crackers... It feels like chewing on a piece of heaven to be honest! 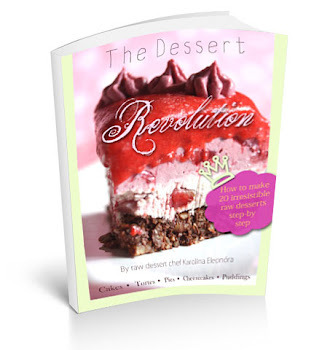 You'll find the recipe for the maca-cream and chocolate recipe [add a couple of drops of mint] in my Dessert revolution eBook, on page 48 (the God Torte). • 1 cup Dates, into a date paste. Pitted and soaked for 5 min. • 1/4 Water for the date paste. Pit and soak the Dates. Grind a flour of the Flax seeds and Pumpkin seeds in a coffee grinder or blender. Transfer to a large bowl. Using a veggie juicer, make the Apple juice by processing apples until you have 1.5 cups. Alternatively you can use commercial apple juice. Pour the juice in the bowl and stir. Make a date paste by processing the Dates with 1/4 cups Water in a food processor. Add the date paste with the rest of the ingredients to the bowl and stir by hand until you have a dough. Spread the dough on top of a teflex sheet on top of a mesh dehydrator screen. Form a large square with a spatula evenly, about 0.2 inch (0.5 cm) thick. Draw a grid with a knife and dry for 2-3 (105 F) before you peel off the teflex sheet. The easiest way to do that, is to flip the entire screen, and then pull the sheet carefully from one corner, so that the bottom side of the crackers facing up. Now you can continue to dehydrate them depending on how dry or leather like you want the crackers. (They will still be leather like after 8 h in the dehydrator.) 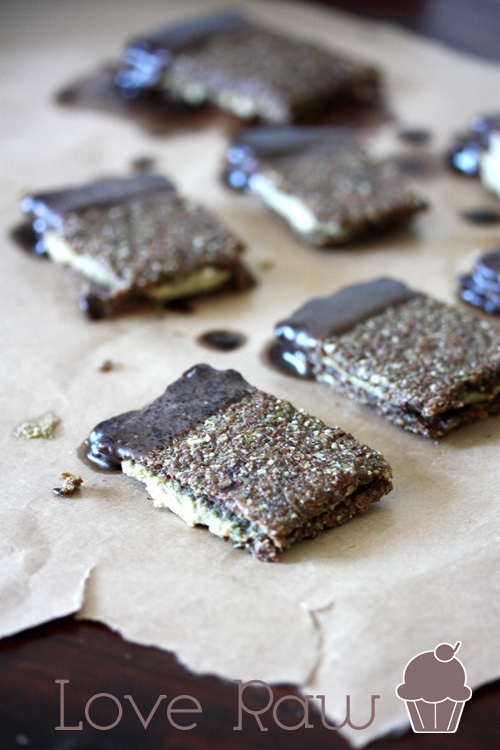 Don't store the crackers in the fridge, as they soften and be floppy. Store them in an airtight container in room temperature. Kärna ur och lägg Dadlarna i vatten. Gör ett mjöl av Linfröna i en elektrisk kaffekvarn eller blender. Häll över i en skål. Gör mjöl av Pumpakärnorna på samma sätt, häll i skålen. Om du har en råjuice press/centrifug, pressa äpplen till 3 dl juice. Häll ner juicen i skålen med mjölen. Gör en dadelpasta genom att processa Dadlarna och Vattnet i en matberedare tills du har en pasta. För över pastan till skålen och blanda med resten av ingredienserna till en deg. Bre degen tunt (0.5 cm) över plast arken som ska ligga över torkplåten/plåtarna. Gör ett rutmönster med en kniv för att lättare kunna få loss snygga bitar när kexen torkat färdigt. Låt torka 2-3 timmar, vänd, dra av plast arken och torka ytterligare 10 timmar tills de är knapriga i den konsistens du vill ha. Förvara INTE kexen i kylskåp, då drar de till sig fukt och blir mjuka. Lägg dem hellre i en lufttät burk i rumstemperatur. Vad smarrigt det ser. Mycket ser gott ut på denna sida. 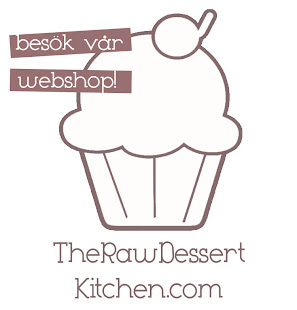 Har lockats av raw food ett tag, men liksom aldrig kommit till skott. Kanske dags att prova lite. Hej Linn och välkommen! Ja gör det som lockar dig ^_^ Registrera dig på mitt nyhetsbrev så får du tips och hjälp! Hej..Precis hittat din blogg Har aldrig känt igen mig i en text som jag gjorde nu när jag läste om hur du beskrev dina känslor. Jag är så lost och det va så skönt att få ord på saker jag känner. Hur hjälper du dig? Pratar du med någon? Vill göra det men vet inte riktigt hur jag hittar rätt person..
Hej Annonym! Du är inte ensam :) Min sambo är ett av de bästa bollplanken nånsin, såväl som andra vänner som utvecklar sig och försöker finna sin väg. Just det jag upplever nu är det svårt att hitta nån annan hjälp än att ställa in sin inre kompass på öppenhet, ödmjukhet, följsamhet inför det som vill utveckla sig. När man vet vad man inte vill ha i sitt liv längre, och har kommit till en kritisk punkt där det är dags att skära av det och vika av från sin gamla väg, kan man känna sig förvirrad. Mycket också för att vår gamla identitet faller av nu, det är därför vi inte känner för att göra saker vi gillade förut, våra gamla drömmar är inte så intressanta längre. Vi går igenom egots död och ingenting är sig nånsin likt. Man får som sagt sträva efter andra värden, söka efter sin Sanning och vara den 100% trogen, lyssna inåt på de behov man har. Sen är det bara att släppa sargen och vara sitt nya jag i varje stund, aldrig se tillbaka, eller "ta upp" de gamla trådarna igen av beteenden, attityder osv. Sluta tänk. Det förstör mer än något annat. De flesta tankar är styrda av våra programmeringar och präglingar och gör ens resa dubbelt så lång. Gå istället in i dig själv och ta kontakt med essensen av dig själv och känn in vad den vill och behöver. Hi Karolina! I'm a brand spanking new reader/adorer, and this post really spoke to me. I LOVE that you're making important and necessary changes in your life, to seek your truth, and looking at this as a birthing process is a perfect - painful, beautiful, natural. You have to do the work, and it's hard work. I didn't until I received a kick up the bum that I couldn't ignore. What helped me [and this was also a part of my process generally] was learning how manage my fear - simply by acknowledging it. The more I 'ignored' fear, the more it chased me. Learning to love myself, just as I am, was also huge - knowing that we're all perfect, whole and complete just as we are. 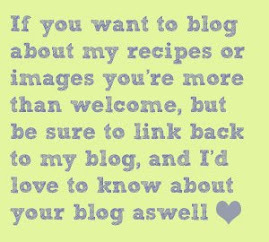 I can't wait to dive into the rest of your blog, and I wish you well on your journey of discovery! Yeah, everybody has to do the work, there's no true escape :) Acceptance is a huge part of success and healing. I heard you. When the old is stripped away, there is no longer a basis or platform of personality with which to relate to the world in the same old way. Something else takes over (or doesn’t and you’re left hanging in silence). 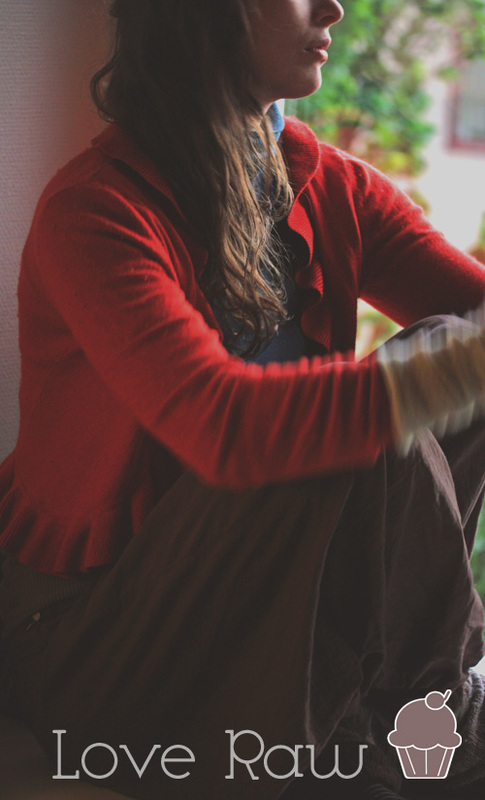 In the end the authentic, real, unflinchingly honest self emerges and faces the world. This cannot be ignored, no matter how much we try to pretend or hide. It always comes back to truth. I felt your fearless expression through to my heart. 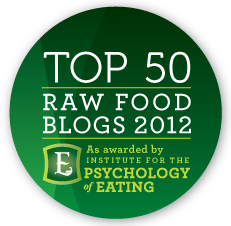 If it was not for living foods I feel certain this awareness would not be supported so purely. Thank you for your courage. I want to thank you for your blog, for your texts, for your courage and for your kindness by sharing your moment. I have felt on the wall, where sometimes I'm almost being able to give up of my old habits and joing the new and fresh consciousness... but in some point I loose my presence and I have one step back. Lys og kjærlighet fra meg! That is an amazing journey you traveled, but one who's trail will be treaded by so many people. You speek beautifully of the things that I myself feel I am experiencing, from whichever direction we came to arrive at the same point, we have connected here in and at this moment. While reading this, the thought of forgiveness came to mind and is sitting there, staring at me and waiting for me to take its hand and let it in. I think we must forgive ourselves for the person we were, in order to move forward. 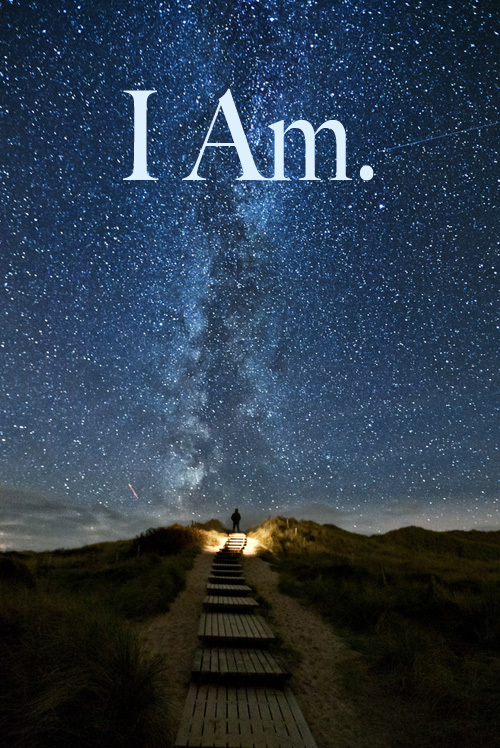 We have to accept that who we were does not have to define who we are. The world is endless, and so is our mind. We cannot allow ourselves to be brought to the idea that either is definite. These are the thoughts your words ignited within me in the few passings I spent reading them. I pray you move through and forward on your journey, and I cannot be thankful enough to have met with you here in this moment today.